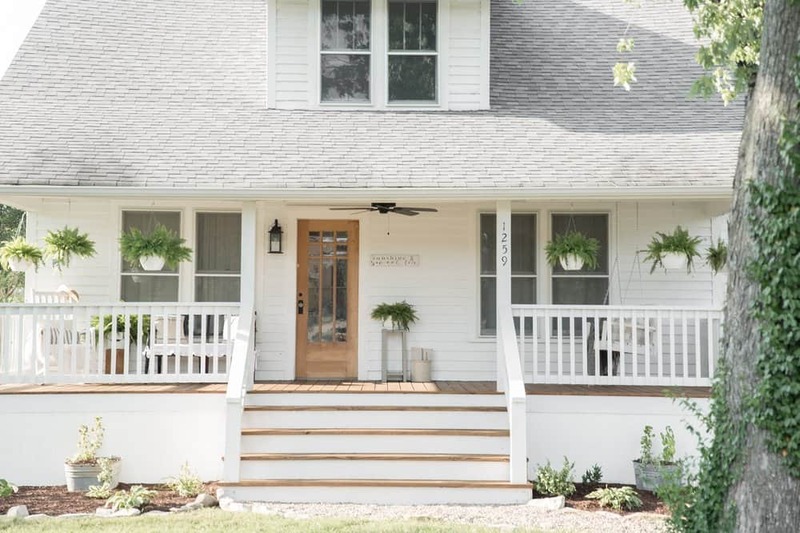 We worked so hard on this farmhouse porch curb appeal makeover. I am so pleased to say it is finally finished! We’ve worked so hard to completely transform the outdated exterior of our nearly 100 year old home. 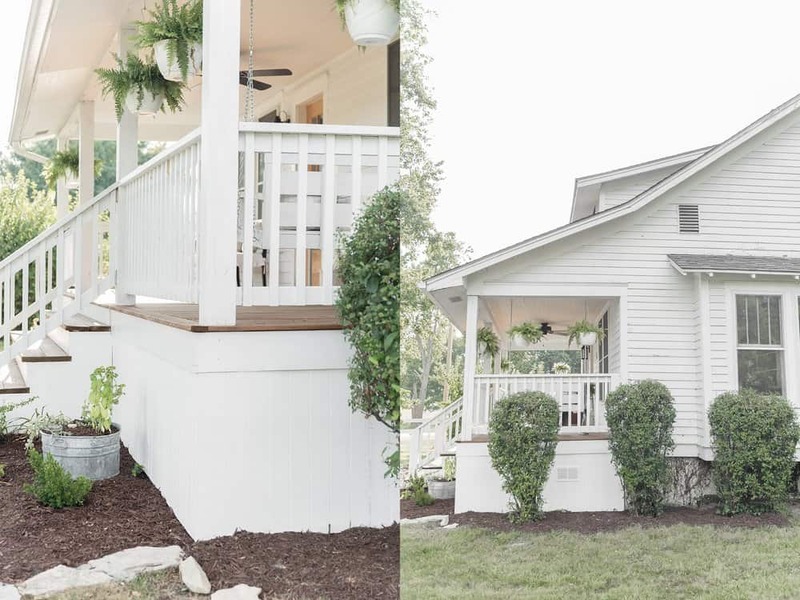 We brought the dilapidated porch on our 1920’s bungalow back to life, and added some much needed curb appeal. I don’t know if I have ever been more excited to publish a post than this one right here! I can’t believe the difference this project has made for our old farmhouse. I’ve partnered up with Lowe’s Home Improvement for this project. See my full disclosure HERE. There is nothing totally offensive about the state of our home these last 10 plus years, but I think we can all agree it had very little in the way of curb appeal. Get all the before photos HERE. 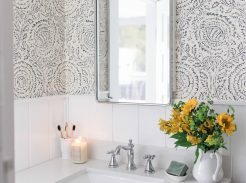 Being the DIY and decor lover that I am, you may wonder how I could let this go on for so long. Well, the simple answer is, I didn’t even know where to begin. I mean, the boards were rotting, the lattice would come off if one of the kids just pulled on it slightly, and a good storm would blow the pillars, that supported the overhang, to the ground. The floor boards were beyond refinishing, and the fixtures and screen door were outdated. 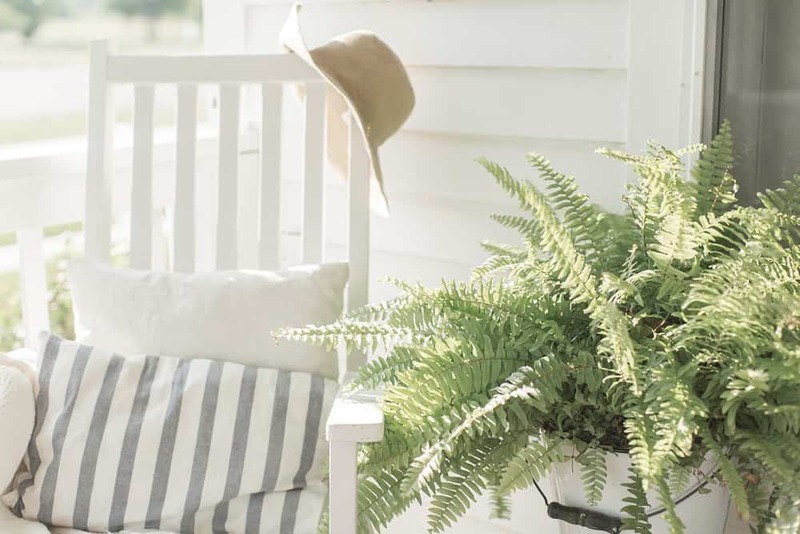 Putting pretty plants and rocking chairs on such a porch seemed almost futile. This thing needed a total overhaul. 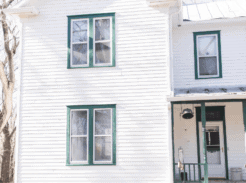 It’s hard to believe that less than $3,000 could make such a difference for the exterior of our home! We did have the help of my cousin to do some building and electrical, but we DIY’ed as much as possible. Removed the old pillars and replaced them with 6″ by 6″ by 12′ treated wood beams. Ripped up the old flooring and laid 1″ by 6″ Treated Pine Deck Board. Took off the lattice and added Plywood Siding to conceal the area underneath the porch. Removed the old iron stair railing and had a custom railing built from one inch by six inch lumber, ripped into one by twos. Removed the solid railing around the porch and had a custom raling built from the same materials as the stair railing. Took off the old screen door. Stripped the paint from the original antique wood door. Stained the treated lumber wood floor with Olympic Maximum Transparent Exterior Stain in Canyon Brown. Replaced the old light fixture with the Harbor Breeze Calera 52 inch Aged Bronzed Outdoor Ceiling Fan. Wired in the Kichler Linford Olde Bronze Outdoor Wall Light to the left of the door. Added a few accessories, like this rocking chair, bench, and ferns. Spruced up the landscaping with a few hostas and new mulch. Outlined our cracking and worn sidewalk with flat creek rocks and filled it in with multi colored pebbles. Painted the new railings, stair risers, and beams with White Semi Gloss Exterior Paint. We decided to stain the floors, so they would stand out against the white house. Stripping the paint from our antique front door makes it stand out from the road, and adds in another wood tone. 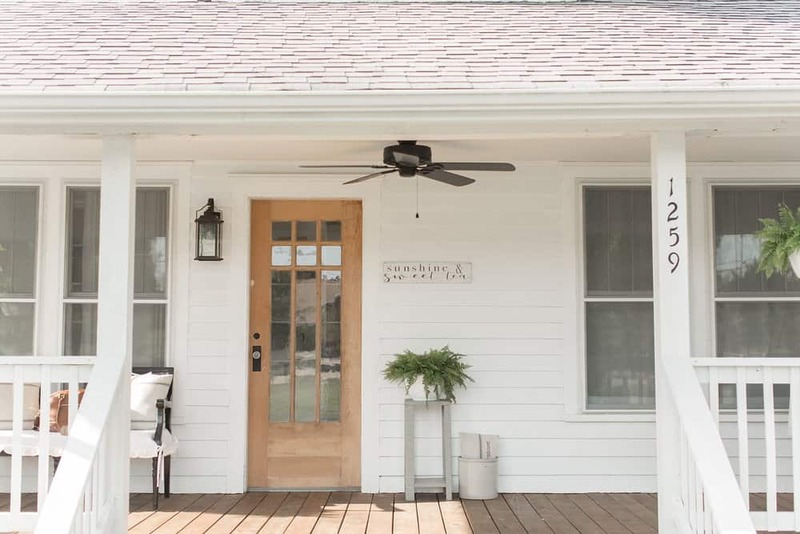 We chose to go with black accents, like we did with our new farmhouse porch fan, lantern style light, bench and house numbers. We covered the existing concrete steps with wood. We stained the stair treads to match our farmhouse porch flooring. 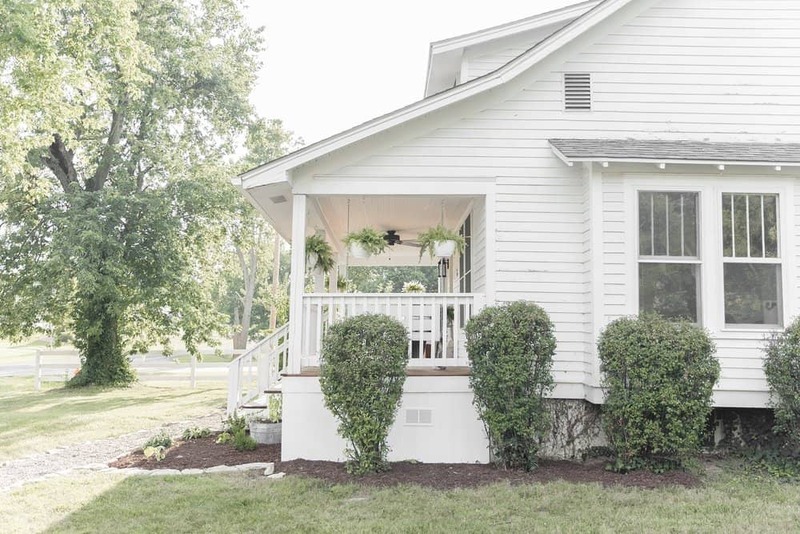 In my last post for this curb appeal makeover, I confessed my dilemma over which direction to lay the porch floors. We ended up going the more traditional route, running the porch perpendicular to the house. 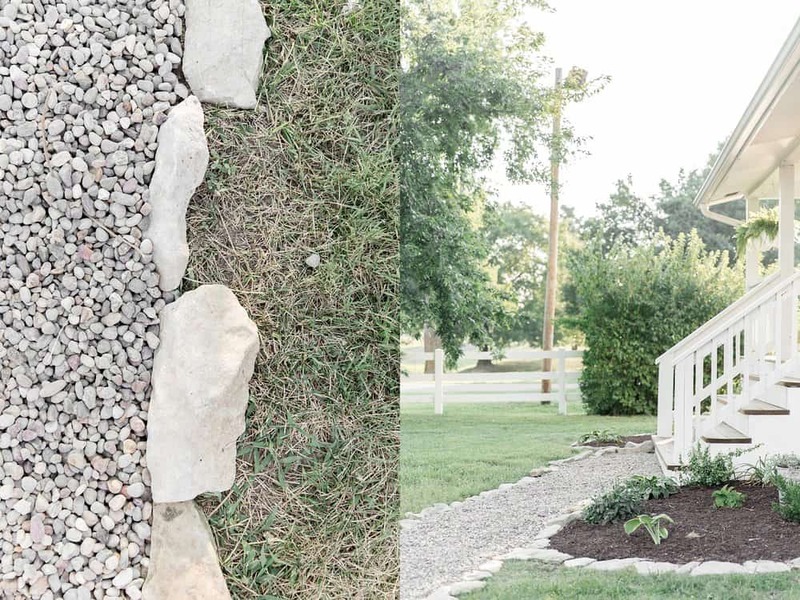 To spruce up the cracking driveway, we did a simple pebble path. I will be doing another separate post on that process, but I love dramatic difference it made for minimal effort and money. UPDATE: You can find that post HERE. Ferns and Hostas add in color, while still keeping everything really natural and neutral. I’ve been hoarding these vintage galvanized tubs, because I always thought they would look pretty in my farmhouse porch landscaping. But, they actually just sat on my porch for years collecting recycling, because I couldn’t decide what to do with them. Remember my problem earlier with trying to add pretty farmhouse touches to an old dilapidated porch. Why bother? After my porch was no longer in shambles, I put one on either side of the steps and filled them with herbs, succulents and coleus. Next year, I will probably use them as a container garden and plant rosemary, thyme and basil. To add in a little more subtle color, I brought out my DIY IKEA tea towel farmhouse pillow, my blue ticking stripe and grain sack pillows and my DIY buffalo check pillows. Tutorials and shopping links for those pillows are linked above! I stayed in my usual neutral color palette of white, wood, black, green and blue. I always know I can hardly go wrong when I pair those together. 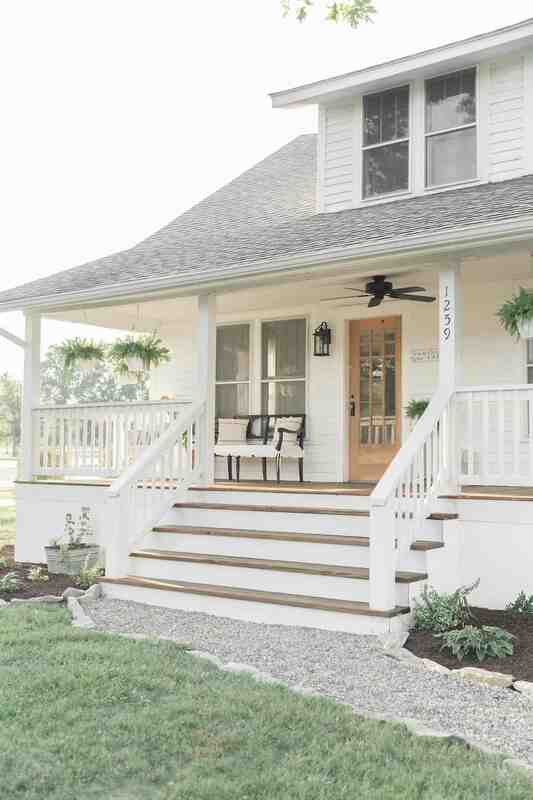 The new slated porch railing really opens everything and makes the porch seem so much bigger. We added some vents to the sides of the solid porch skirt, to provide ventilation, and keep moisture from building up under a completely enclosed porch. To spruce up the landscaping on both sides of the house, we trimmed the bushes and added some fresh mulch. The only thing we left with our original porch, other than the floor joists, was the white beadboard ceiling. 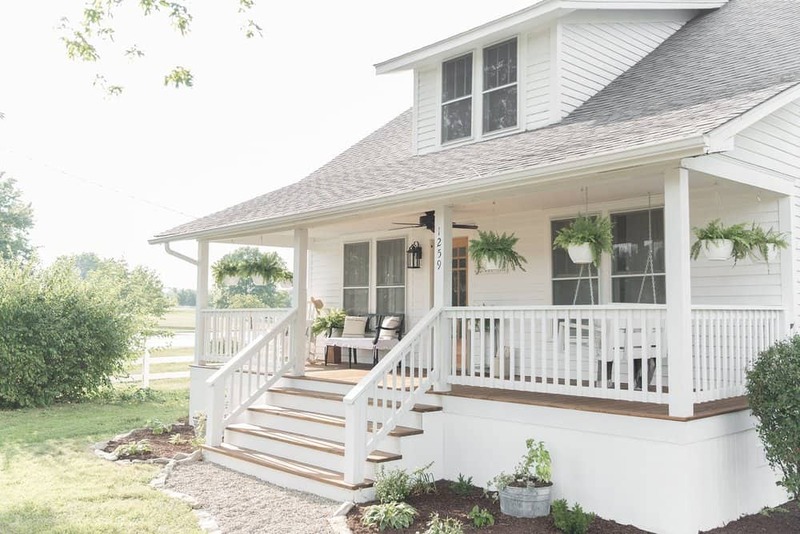 I love that it runs the entire length of the porch and adds to its farmhouse charm. 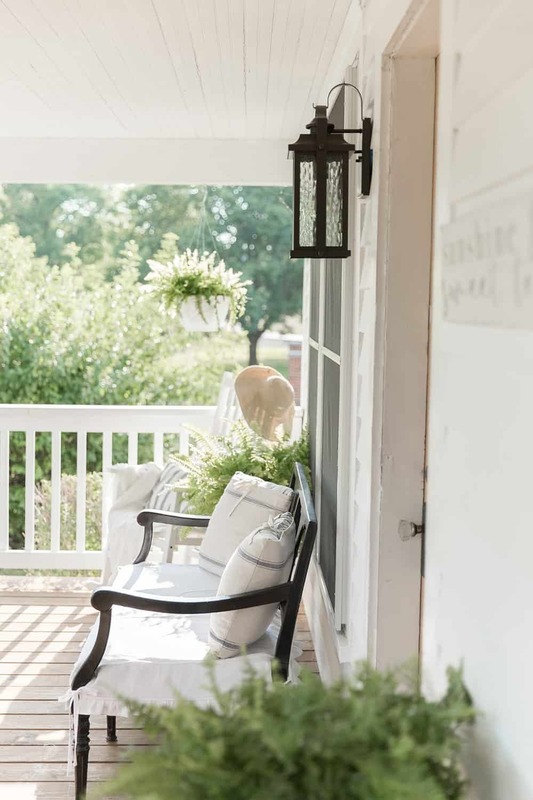 I think farmhouse porch furniture should be kept simple and minimal. I decorated this white rocking chair with a few simple pillows, a white vintage blanket and a straw hat. My husband built this white farmhouse porch swing. 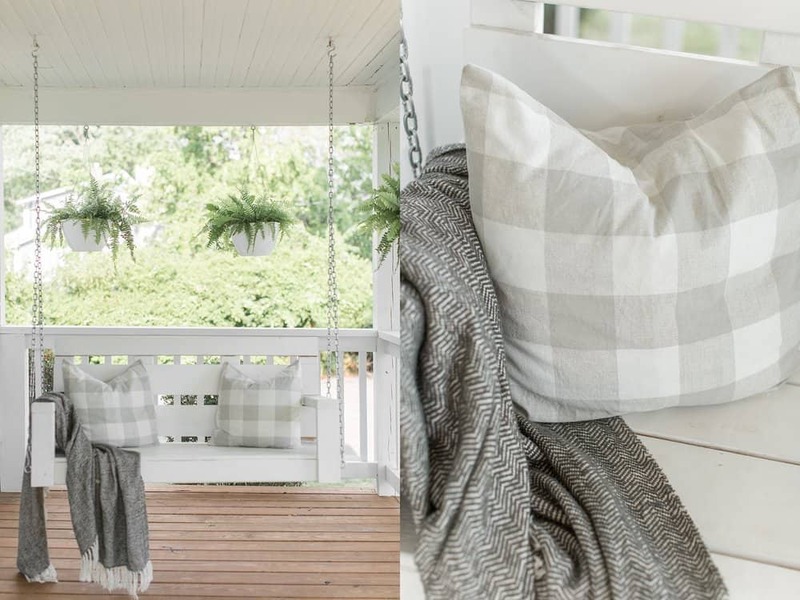 I kept the styling minimal, with a few gray buffalo check pillows, and this simple blanket, to tie in a little more black, on this side of the porch. I love this new space so much! 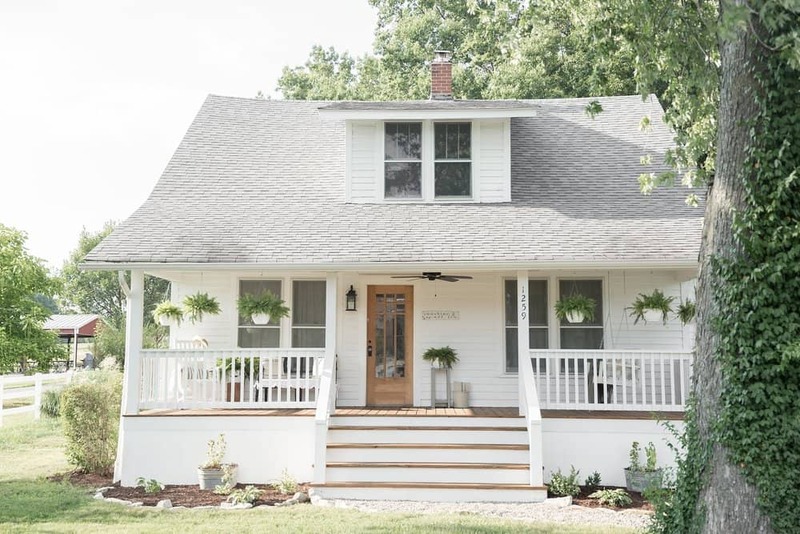 I think it completely transforms our entire house, and gives it more of the simple farmhouse character from the outside, that we already have going on inside. I can’t wait to fill it with pumpkins this fall, and spend cozy evenings on the porch swing with warm blankets. This is definitely a place I am proud to call home! This post was sponsored by Lowe’s. See my full disclosure HERE. Love your beautiful updates you made. Thank you so much for stopping by, Dianne! I really appreciate it! 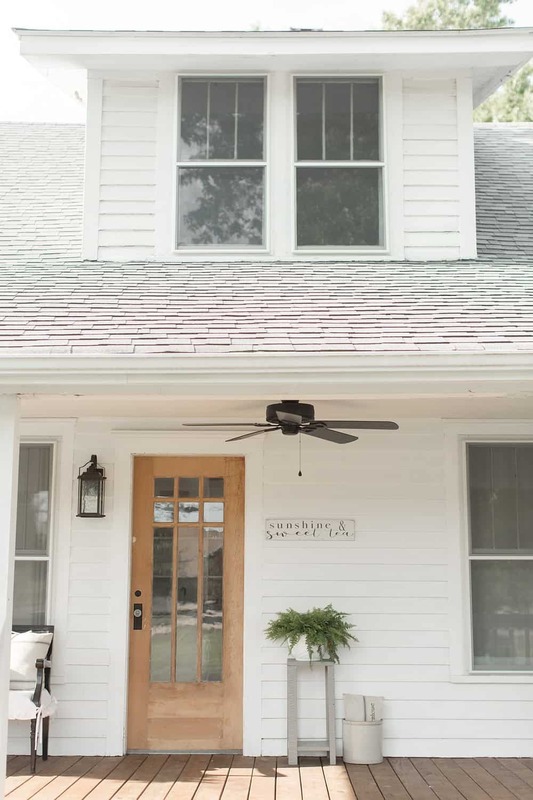 Just wondering…was any consideration made when removing the tapered porch supports that are important architectural elements in this historic arts and crafts period home? Yes! I definitely considered that. I actually thought long and hard about it. But, the original craftsmen style supports were rotting out and old. We didn’t know how to rebuild them like they were before. We went the more simple route, and I’m glad we did, because I love the new look. I wondered this too, but I appreciate your honest answer so much. I’m sure other readers will also appreciate that sticking to a budget sometimes means making hard decisions. Beautiful! What an amazing job, I have been waiting to see this "after" pictures, so glad they are finally in! You should be proud of all of the work that went into this. Thank you so much for stopping by and leaving this sweet comment! I really appreciate it! Thank you so much Melissa! It was a huge undertaking, so that means a lot! Oh my – what a big difference! Great job! Thank you Sandy! You are so sweet to stop by and leave a comment! Thank you so much Debra! I really appreciate you stopping by! This is absolutely stunning! You are my favorite and my inspiration as I fix up my old lakehouse. In fact I am going out to buy the same color stain for my porch and the same light fixture. I just love everything…you are so talented and I look forward to reading all of your posts. Oh my word Lisa! Amazing transformation! 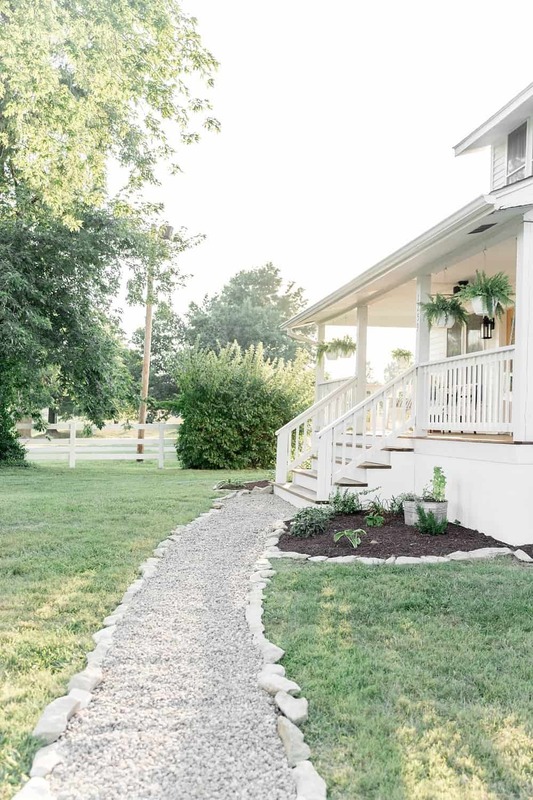 LOVE how your front porch turned out. 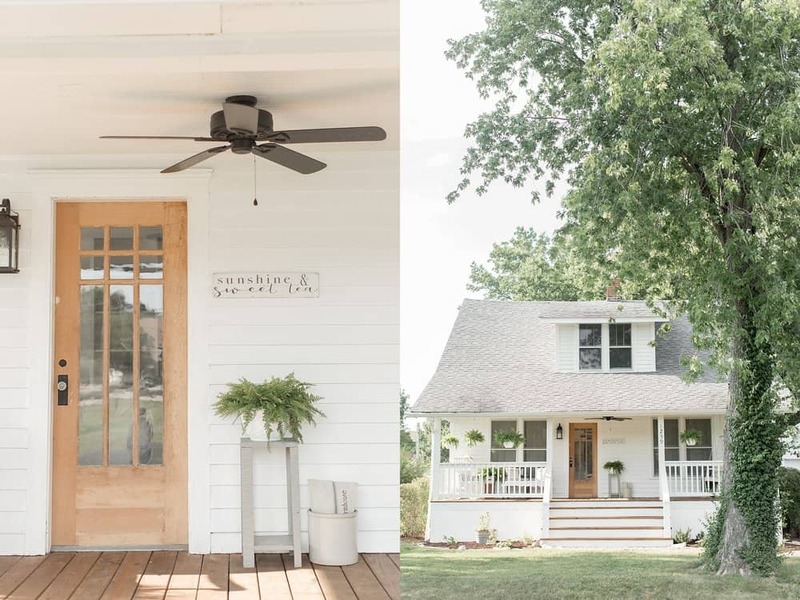 Cutest farmhouse on the block, no doubt! 🙂 Thanks for providing the breakdown of everything you did. Awesome job! Thanks so much, Julie! Your porch was really inspirational to me through this whole process! It’s simply stunning! You’ve outdone yourself, Lisa! Thanks so much for all your support, Julie. Always appreciated! This transformation is amazing!! It was so great meeting you at Haven and I can’t wait to go through blog! Been following you for about a year, mostly because you are a local blogger. Now I recognize your house! I’ve passed by many, many times. My daughter lives a few miles outside of town, so we are there often. I love what you are doing, your style is refreshing! And love that street sooo much, I wish we could get one of those houses, but will be content with our lake home I guess. Absolutely brilliant!!!! I love it!! Lisa, just gorgeous. You all did an outstanding job and all your design choices are so well thought out. What a welcoming place to greet visitors or relax with a good book and some sweet tea. We don’t have a front porch, but when I visualize the perfect one, I’m going to imagine yours. Thank you so very much for stopping by and leaving your sweet comment, Ardith! Looks really beautiful and farmhouse pretty. You did a great job! You have breathed new life into this home! Awesome job!! Thank you so much Zenda! 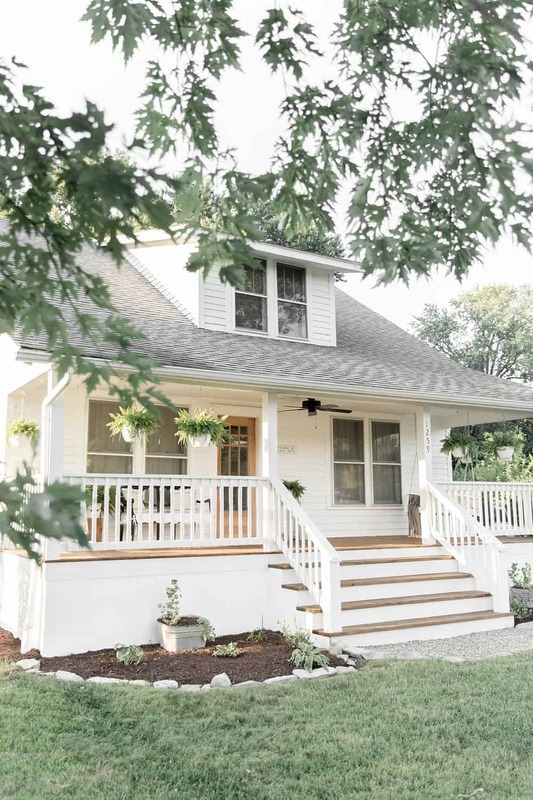 I LOVE everything about your new porch! I was wondering where you found the Sweet Tea & Sunshine sign! Wow, what a beautiful transformation! We are currently re-doing a farmhouse and picked out the same exterior lights. Just curious what size of light did you go with, is that the 17in or 22in Linford? Just trying to figure out which size to go with! Thank you! Beautiful! Did you link the paint color you chose for the railings and exterior? Yes! It is just plain white, but I have it linked. 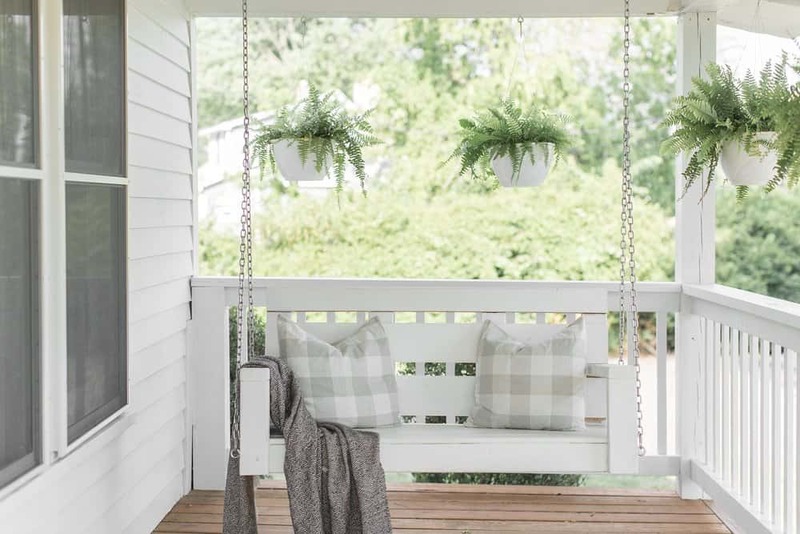 Love your porch, and especially love the porch swing! Do you think you or your husband would be up to doing a tutorial for how to make one? I love your videos on YouTube, and stopped by your blog to look up how to start sourdough while getting my daughter to sleep 🙂 thanks for the distraction and information! Thanks for pointing that out! I will fix it. 🙂 Also, that sounds like a really great post/video idea! WOW! love what you’ve done with your whole front area. Been looking over what needs to be done to our country house area and you gave me some wonderful ideas. Prev owners left a 12 ft church pew on porch…odd but I love it. Prob will power wash, sand a bit and oil it. Porch swing on other side so I’ve got country going on but will sneak some of your homey, cosy touches around. Gotta pillow up the pew for sure. Will send pic when completed. Thanks for sharing your journey. Hi. I want to know what material you used for the solid. porch skit instead of the lattice.? Thank you. Thanks for sharing your porch replacement experience in words and pictures! 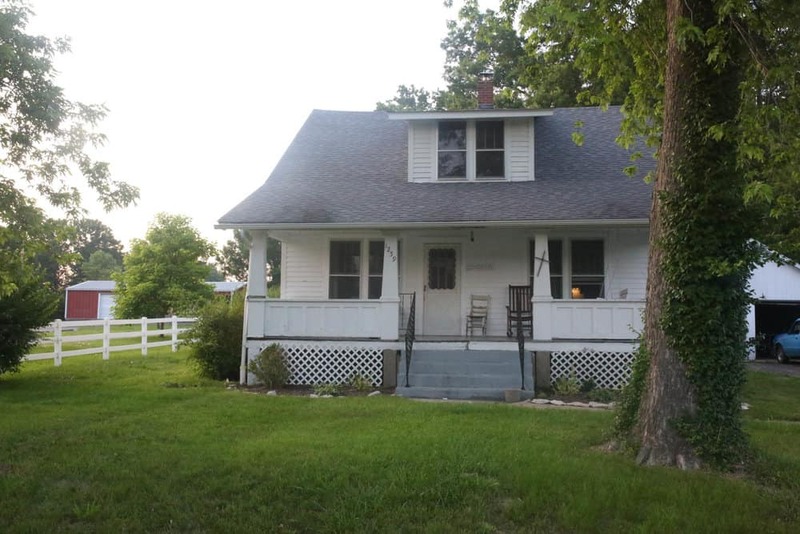 We also have a 100 year old home, a two-story with white vinyl siding, black roof and shutters. It’s seen many, many home improvements over time. This year, the front porch including the columns, tongue and groove flooring and wood railing all need replaced. Because the house was orignally a duplex (we opened it up into one house) the front porch is big! *34 feet long by 8 feet deep*. (I’m curious what your porch dimensions are). Finding a contractor to do this project was the most difficult time we ever had in hiring someone for a home improvement! Several contractors said they would only put down (pricey) composite wood. One with 30 years construction experience said he’d never done a tongue and groove porch. A few came to take measurements, then never got back to us with an estimate! We’ve finally signed a contract with a local guy and are on his waiting list—he says he will start in about two weeks. The current flooring runs perpendicular to the house which we love so the new porch boards will run that way, too. Our porch has an old coal cellar below which opens into our basement, so we are unable to use wood decking (altho it’s perfect on our back porch). We will paint the floor light gray and have a darker gray foundation. We’re going with white vinyl railing this time. 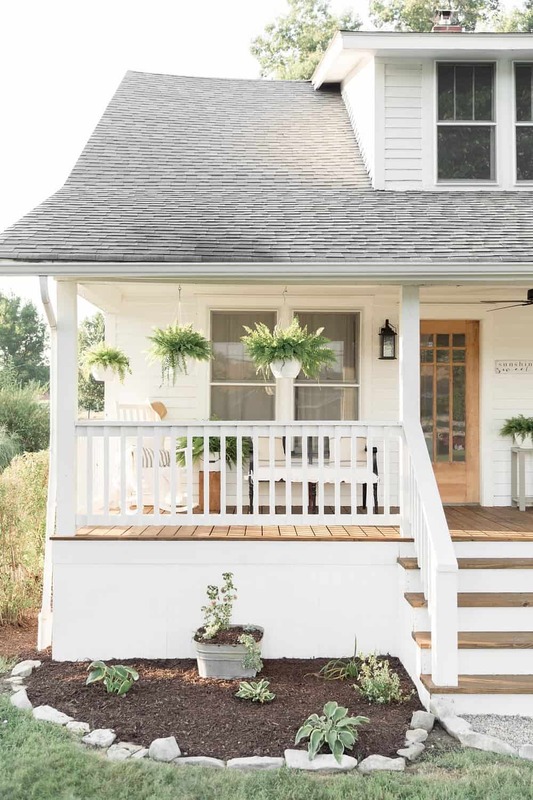 I was especially impressed with how you covered your cement steps with wood; it really bumped up the entire porch’s appearance to another level. 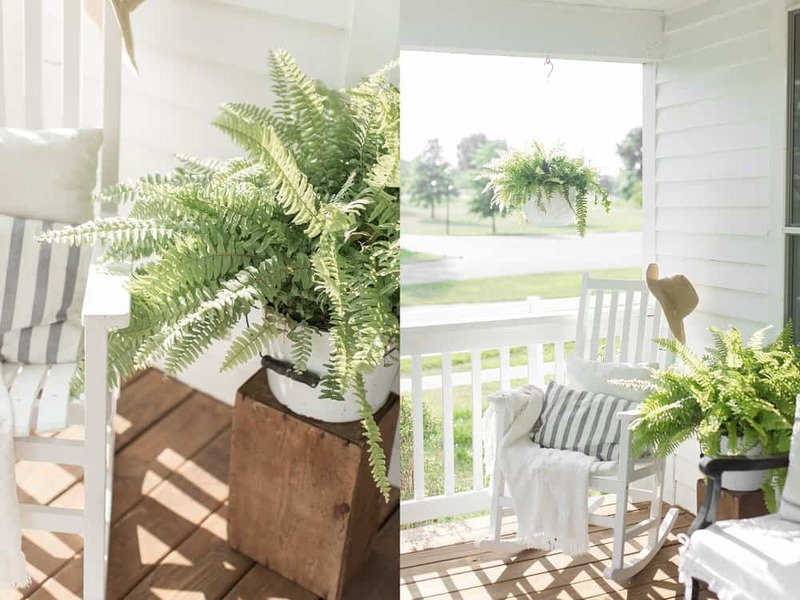 Your porch makeover really updates & transforms the home’s look! Thank you so much!! 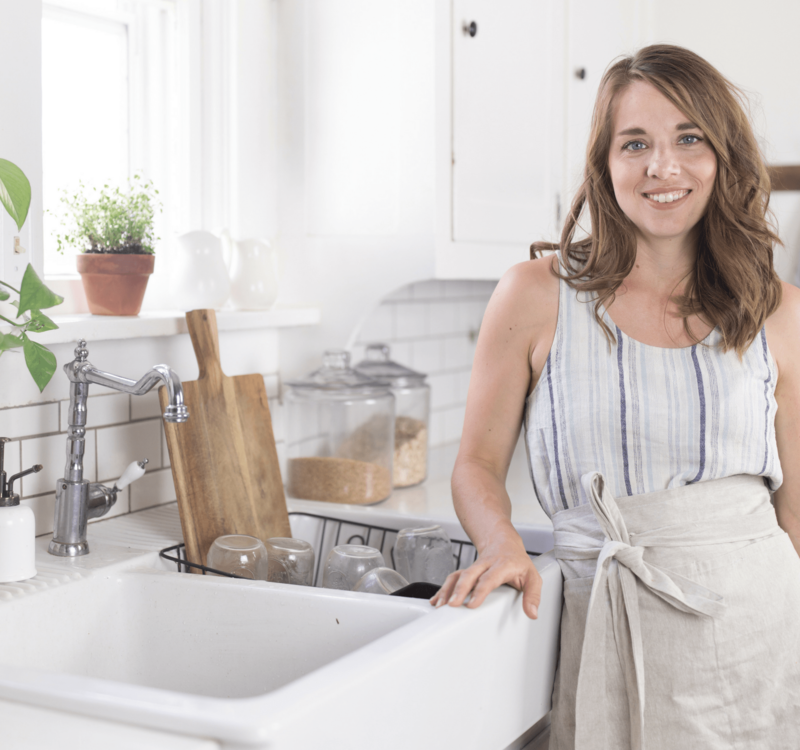 Your renovation sounds like its going to be beautiful. I don’t know the exact dimensions of the porch. I would have to go out and measure. Its pretty good size though! We had my cousin help with a lot of the renovation, so we didn’t have to get a contractor for the job thankfully! How did you add the glass on the front door? I don’t think it’s the same door…you can see the top edge is thicker in the new one. what a scam. One of your pictures on your web site would be perfect for the cover of a book I am about to self publish. Would it be possible for me to use that photo? What would be the conditions? 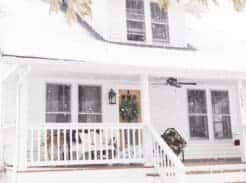 The picture is the one of the porch swing with the blanket on it.